The majority of homebrewers in the UK start with dry yeast, moving onwards to specialist liquid strains later. Often those strains might be British ale strains, traditionally used for UK style ales, or the ubiquitous WLP001 (the “Sierra Nevada” strain), so here’s a brief selection of 5 strains you might like to try if you’re looking for something new and some with some alternative uses to perhaps the “standard styles”. If you’ve got a strain you love that others might not use so much, please add to the discussion! The supposed origins of this strain are hinted at in the name – Forbidden Fruit translates from the Dutch “Verboden Vrucht”, a beer now produced by giant conglomerate AB InBev at the Hoegaarden Brewery. I find this strain works particularly well in classic Belgian wit beers, though Verboden Vrucht is more of a strong Golden Ale – it has a classic phenolic character backed up with fruitiness and tartness that is associated with Belgian Witbier. A temperature towards the mid-to-upper end of the range works well to bring those characteristics out- 21-23C has worked well for me in the past, and I’ve also used it with success in my own version of Magic Rock’s “Clown Juice”. This yeast is a monster. It leaves everything fantastically dry, and have seen up to 97% attenuation (from 1062 to 1002). Coupled with great citrus esters, this is perfect for saisons, not only because it doesn’t need to run at very hot temperatures to achieve all this. Many commercial breweries are supposed to have used this during the “UK saison boom” of the last years – the original source supposedly being Brasserie Thiriez in France. It perhaps doesn’t have the complexity of Dupont, and in commercial terms might be argued to be used all over the place, but it’s still great for the homebrewer. Perhaps use this to dry out a stubborn brew started with another strain? Another yeast for Belgian style ales, this is potentially widespread in use within the Belgian brewing industry. If the original source is as supposed, Westmalle, Achel and Westvleteren all use this strain (and I suspect others – I get some similar characteristics to Brugse Zot). This is more restrained than WLP500 (which is the supposed Chimay strain) – still with enough character to be effective in dubbels and tripels, but without creating a total banana-bomb. I’ve found this to work well in more restrained Belgian Pale ales too: fermenting at a cooler temperature (18-20C) has worked for me in this instance, whereas slightly higher worked better for a dubbel which is more fruity. One thing to be wary of – this yeast will go into sulk mode if the temperature drops during fermentation, so you need to be careful with cooling. I’ve had to pass bottles through the airing cupboard to bump the temp up to get them to condition post-crash cooling after fermentation. Lagers still get a raw deal in the UK – mostly through reputation as fairly tasteless cold fizzy keg, and often presented with a generous helping of DMS to wash it down. There are a few good UK lagers, but even fewer that venture into realms such as Märzens, Schwarzbier, Dunkel and Bocks [this is a gaping market hole in the UK specialist beer market IMHO...]. This also seems to be true for homebrewers. Looking at entry statistics for previous competitions, there is a strong bias away from the lager categories – this may be due to lack of equipment/temperature control like for many commercials, but if it is just a case of unfamiliarity or thinking that you don’t like lager, I’d urge you to give it a go. Here are two strains you could try aside from W34/70 or WLP830 which are two of the “goto” strains. I recommend pitching cold (~9-10C) with a big pitch for both these yeasts – double what would be correct for an ale type ferment is about right. There is little disagreement over the source of this yeast which is always quoted as being the Anchor Brewing strain. This is better known for its use in California Common or “Steam” beer where it ferments at about 16C. However, it will ferment very nicely at proper lager temperatures, and it behaves much like a German lager strain, kicking out a pile of sulphur during the ferment (though thankfully this dissipates well in my experience). With the right amount of yeast, it ferments strongly and works well in many styles – Märzen and Schwarzbier are two styles that I have used this in with success, leaving clean, crisp beers with good malt profiles – I’d expect it to also work nicely in something like a German pilsner as well. This is a versatile yeast to have around, and probably a good choice for anyone who doesn’t have temperature control, but who has a cool (but not freezing!) place to ferment in the winter/early spring. Malt! Malt and more malt – this is a strain ideally suited to use in beers such as Helles, Dunkel and Bock and is supposed to come from the Ayinger brewery. Again, this throws off sulphurous smells during fermentation, perhaps not as much as 810 though, and it tends to clear well given time and cool temperatures. The attenuation is perhaps a little lower than 810, but this will depend greatly on grain bill and mash profile – two experiments with Dunkel brewing and this yeast indicate that a step mash and some pils malt helps enormously where there is a very high percentage of darker base malts like Munich II. The malt aroma and flavour profile this yeast produces is excellent – with darker malts like Munich,breadcrust, toast and some nutty aspects come through very nicely indeed. 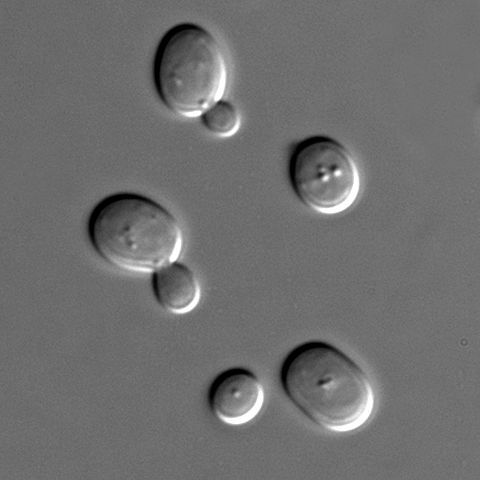 So there you have 5 yeast strains that you might like to try to experiment with if you haven’t already used them – if you have a particular favourite strain then please feel free to discuss it below – and remember that there’s a wealth of information to be had on forums and manufacturers’ sites over and above all this. Very interesting read. I like the sound of that WLP810 for cool (not cold) Largering. Cheers Graeme!